Christine Walker creates thematic activities and visuals for distinctive, powerful group experiences. Designed to support the initiatives of the client and suit the particular culture, Christine’s custom retreats and offsites incorporate her multi-disciplinary skills in visual and narrative arts, as well as expertise in creative process, leadership, branding and messaging, and team-building. 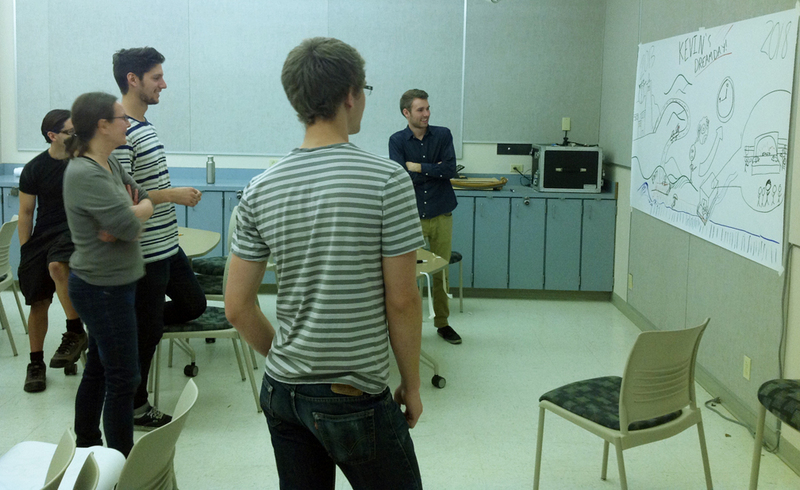 They are ideal for groups wanting to envision or re-vision their organization as a whole or any aspect of it. From that discovery follows the articulation of goals, strategies, and actionable tasks. A powerful communication tool, visual storytelling helps to understand problems…. As a presenter, Christine shows why strategic visual thinking works and inspires groups toward more powerful ways to communicate and realize collaborative visions. As a workshop facilitator, she offers customized training for individuals and groups wanting to learn or enhance their visual thinking skills, visual and narrative storytelling, “story catching,” and other content capture. Humans use visual thinking naturally, and it’s fun and rewarding to become more confident in expressing thought visually. Following are basic presentations and workshops to be customized for your meeting, organizational development, or professional growth. The Talk is an overview of strategic visual practices. Come prepared to listen, participate in short visual thinking exercises, and have a good time! Bring a notepad, sketchbook, or digital tablet. The Workshop is a hands-on session(s) to gain strategic visual thinking skills and explore approaches relevant to your goals. Come prepared for active, whole body learning. Materials are included in the facilitator’s fee structure, depending on number of participants. 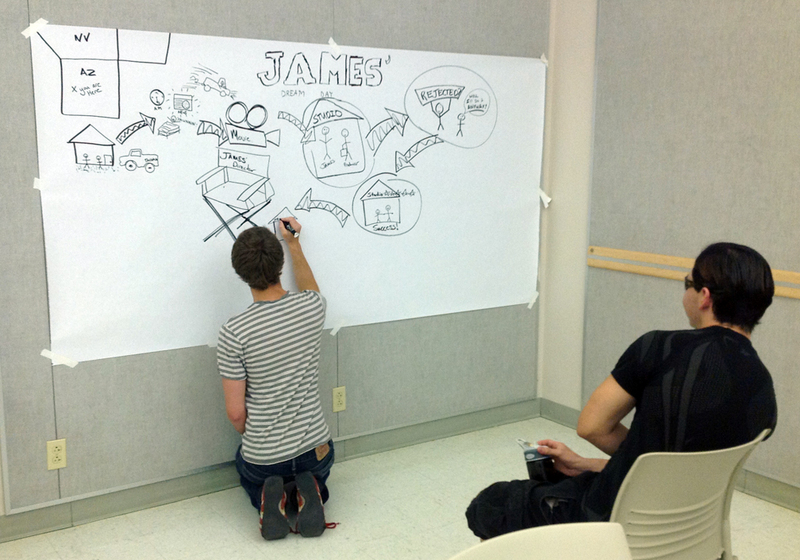 Visual thinking activities are productive for team-building and navigating organizational and cultural change. The Talk with Workshop Package combines a brief presentation to a team or leadership group with a followup workshop for that group and/or additional participants. The training helps people reawaken dormant visual thinking skills, build confidence, and innovate practices to serve their professional or organizational goals. The overview and workshop can be consecutive, or, if you aren’t sure your group is ready for training, the overview can be a preliminary to further exploration. 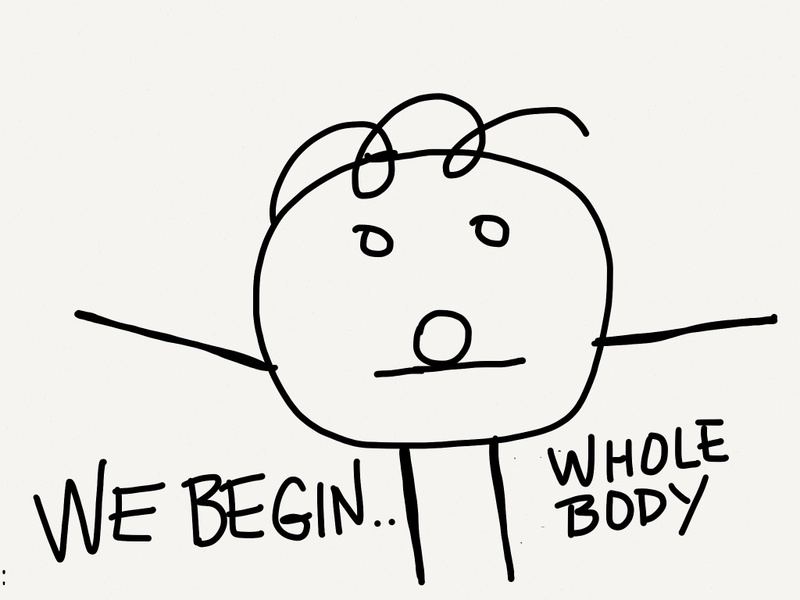 We begin as whole body thinkers, whole body learners. The senses of taste, touch, smell, and sound are more powerful than sight to the newborn. As babies, we begin to see the world and know it from the body. Visual thinking is a natural form of expression. We may draw before speaking and certainly before writing. We are eager to express meaning and to make sense of things. Long before the printed word, charcoal marks on cave walls and scratches in stone inspired and informed people. Now we’ve come full circle to a visually literate culture where drawing—from napkin notes to whiteboards, paper murals to digital tablets— is increasingly a strategic tool for group envisioning, future planning, leadership, and organizational development. Visual, whole body thinkers are powerful leaders. “In the perception of shape lie the beginnings of concept formation.” In his groundbreaking book, Visual Thinking, perceptual psychologist and Harvard Professor Rudolf Arnheim reinvested perception with authority that is even more relevant today than when the book was published in 1969. In past decades (TV, movies, YouTube, computer graphics programs), our culture has become increasingly visual. But the arts have not been a core subject in public education, so many people lack confidence or proficiency in their visual thinking skills. Reinvesting learning modalities with skills derived from the arts provides a strong foundation for agile thinking and life-long learning, which are essential for organizations and businesses to succeed today and sustain for the future. 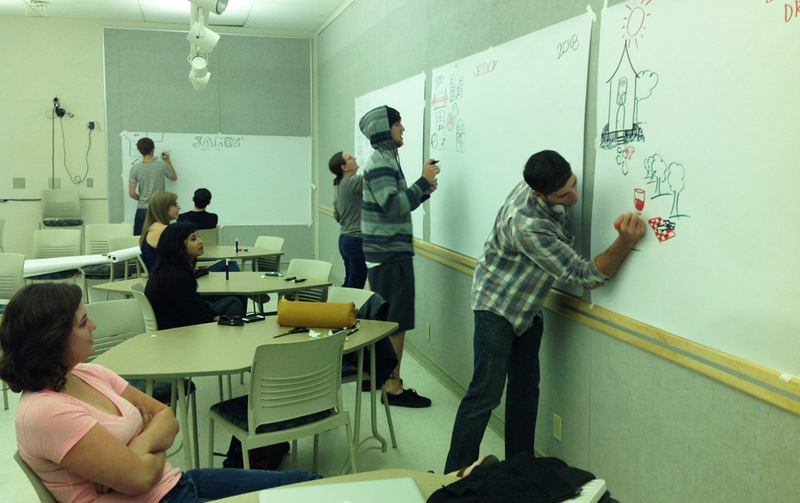 AIGA senior design students at a California State University learn visual facilitation skills in a workshop. Working in pairs, the participants elicited “Dream Day Designs” (future state thinking) from one another as I guided the facilitators in questioning, listening, use of metaphor, and other techniques honed by successful visual practitioners. Contact Christine Walker, MA, MFA, for visioning retreats, presentations, or workshops.